Goodbye Poems for Friends: The very thought of not having your bestie by your side is sad and heartbreaking. If one of your close friends is moving interstate, going overseas or relocating to another city – take ideas from this post to write the sweetest quotes on a farewell card. Your heartfelt wishes will be a source of strength and inspiration. Apart from the greeting card, whine out aloud on Facebook, Twitter and Pinterest to express how gloomy you are. Bring the saga to a pinnacle by dropping your friend at the airport so you can be with him or her till the very last moment. Hold back the tears, give a cute hug and watch your friend walk away so that both of you can clinch on to the beautiful memories of your friendship… no matter where you are. 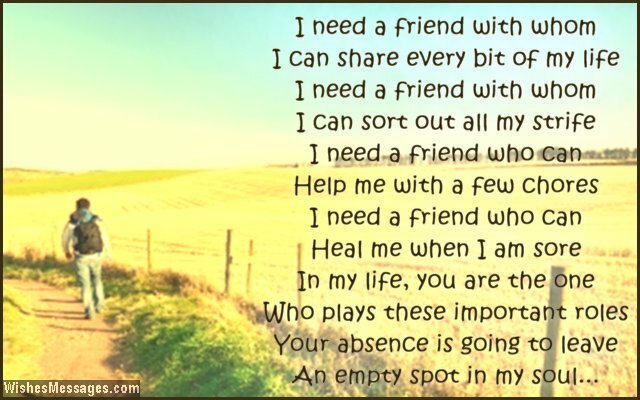 4) To my dear friend….